An Indian Polar Satellite Launch Vehicle (PSLV) carrying the radar-surveillance satellite RISAT 1 launches to Earth orbit in April 2012. A big piece of this PSLV is expected to crash back to Earth on April 3, 2018, give or take a day. The Chinese experimental space station Tiangong-1 fell to Earth on Sunday (April 1), with a whimper rather than a bang: Most of it burned up over the southern Pacific ocean. But hundreds of thousands of pieces of space junk still circle Earth, and Tiangong-1 won't be the last to take an uncontrolled plunge into our skies, experts say. Of particular note is part of an Indian Polar Satellite Launch Vehicle (PSLV) rocket that delivered a remote sensing satellite into space in April 2012, said McDowell, who tracks the launches, orbits and deaths of spacecraft and details this information in the email-distributed newsletter Jonathan's Space Report. 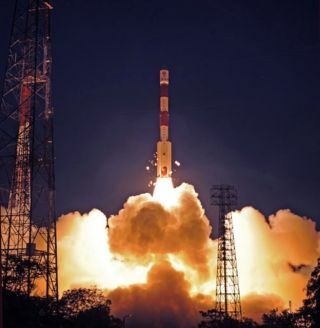 The PSLV rocket body weighs about 1 ton (907 kilograms) — far less than the 9.4-ton (8.5 metric tons) Tiangong-1 — and is expected to enter Earth's atmosphere tomorrow (April 3), give or take a day, according to The Aerospace Corporation, a California-based company that tracks re-entries. The PSLV, like most of the space debris surrounding our planet, is traveling in a circular path around Earth. When the orbits of such objects dip below that of the International Space Station (ISS), which flies at an average altitude of 250 miles (400 kilometers), their days are numbered. How fast they come down depends on how big they are relative to their mass, McDowell said. A large piece of material with little mass will fall like a leaf, whereas a small, heavy piece will fall like a cannonball, he added. That means an object much higher up could come down faster than one at a lower altitude. Not all space junk is orbiting in a circular path, though. Almost on the same day as the PSLV is expected to re-enter, part of a half-ton (440 kg) European rocket, an Ariane 5, will be heading for Earth, according to Aerospace. The Ariane 5 launched in May 2007, and it traveled in an elliptical orbit, dipping close to Earth and then swinging around into a high altitude several times to deploy the Astra 1L and Galaxy 17 communications satellites into geosynchronous orbit, some 26,000 miles (42,000 km) above Earth. After the rocket finished its job, some of its components — including its payload dispenser, called a SYLDA (for "Systeme de Lancement Double Ariane") — continued along the elliptical path, losing energy each time it dipped close to Earth. As of April 2, it was reaching 295 miles (475 km) in altitude at its high point and 96 miles (155 km) at closest approach — treacherous territory for a satellite. The relatively thick atmosphere down so low saps the craft's kinetic energy, and eventually, it won't have enough to rise again. But the SYLDA spends little time at the lower altitude — 22 minutes out of a total 90-minute orbit, as of April 2, said McDowell. It's traveling at 17,900 mph (28,807 km/h) at its closest approach, so it has enough momentum to evade the danger zone. For now. Looking a little further into the future, McDowell said the next large object of concern is NASA's Rossi X-ray Timing Explorer (RXTE) satellite, a 3-ton (2.7 metric tons) craft launched in 1995 to capture X-ray emission data from white dwarfs, neutron stars, black holes and other X-ray-emitting objects. It was switched off in 2012 and, for the past six years, has been zooming around Earth as space junk, he said. RXTE could re-enter sometime around mid-April, McDowell said. "That's a re-entry that, if you're underneath it, you'll see a nice fireball in the sky," McDowell said. "There might be some small pieces that reach the surface." Whether any of those pieces will reach Earth — and if so, where — is anyone's guess.